Our craft today, started with D (age 8), fringing the edge of a folded paper plate, in triangles. Then folding them down, to make a shark's jaw. As he colored the outside gray, he was trying to figure out how to attach google eyes, without making the tooth-filled mouth, look like a crab, or too much like his monster mouth craft. Finally, he decided it needed a body. So, I cut a simple fish-like outline, from blue construction paper, while he worked on drawing, and cutting out, a small snack for his friend. E, glued the pieces together for us, and D added a few final touches. 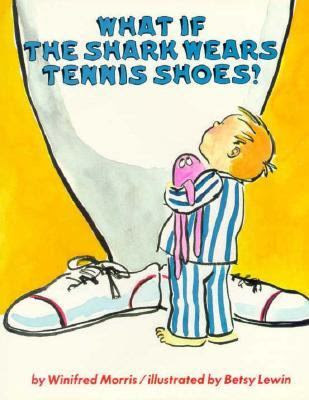 ...or Winifred Morris' What if the Shark Wears Tennis Shoes? For more story based arts and crafts for children, check out this week's stART (story + ART) link-up, at A Mommy's Adventures. I love this craft! Have you read Never Take a Shark to the Dentist? We like that book! Christy - I don't remember that one, I'll check it out! I LOVE this!!! My daughter will love doing this. I am a HUGE fan of your site. Thank You for sharing so many amazing ideas and glimpes into your homeschooling life. This is great. We just went to the aquarium on Saturday and my son (23m) can't stop talking about how big the nurse shark was. Obviously I'll have to do most of the work, but that boy loves tape & glue sticks. That is the cutest shark craft I have ever seen! I just love how you manage to accommodate diverse interests of your children! This shark looks awesome. Do you have the shark template??? You are right it is is the cutes shark craft. Sorry - I just freehanded the shark - which is why it's such a simple shape. To make it easier, I sat the teeth on top of the paper, and drew around them. I saw this craft linked on one of the pages on Facebook, and it is awesome! I am a children's librarian in a beach town, and we will definitely love doing this one! Looking forward to browsing all of your other ideas, and have you bookmarked in my browser now. We have a Homeschool Social group that meets in our library, and I am going to be sure they know about your site too! :) Thanks so much! I jotted down this idea for the future. My boys have requested a "sharp-toothed animals" unit that I keep meaning to get to. Oh, this is so funny!! I'm saving this for when my kids get a little older. Very cool looking shark. My son approves and wants one of his own! Bahahaha! I love D's addition of the "fish food"! Love the shark. We'll definitely have to do this sometime. The teeth look so real...lol! My son will love this! That is awesome, I love this idea. I am not sure how I missed this. I love this and I think it is wonderful that D was able to come up with the craft himself. I think he got some of his momma's talent! Wow, that is too cute. Thanks for the great idea! Tis is one of the cutest paper plate crafts ever. Adorable! I'd love to have you stop by my For the Kids Fridays Link Party and share! Stop by and check it out! I'll be doing this with my K class tomorrow - will post about it on my blog... AWESOME idea! Thanks again for the awesome idea - here's my post about it. Mr. A - I couldn't get the comment feature on your blog to work today, so I'll leave a comment here, and hope you see it. D couldn't be more thrilled to see other children doing his craft - very neat! I shared this in my Shark Round-Up today at Happy Home Fairy! Would love for you to swim on by and take a bite out of the fun (and pick up a Fairy Button)! Everyone LOVED your idea! super cute! I definitely want to share with my readers when I do a shark party theme! This craft is cute! Big Shark's Valentine Surprise is a good book also that COULD be used with this craft! I love this! I am going to have my daoughter do this, but cut the teeth part fringe style and make it a whale, for the story of Jonah. Thank you for the great idea and inspiration!! Just letting you know that this blog http://easypreschoolcraft.blogspot.com/2012/05/shark-paper-plate-craft.html has copied your entire project and photo to their blog. Our editor was inviting crafters to submit their projects to Fun Family Crafts and did not realize that this was yours and left a comment there. When I went to feature it I realized it was yours and featured your link instead. I am from Hong Kong Shark Foundation. Thanks for sharing. We like the idea a lot! Could we use it in our Newsletter? Hong Kong Shark Foundation - That would be fine. Thanks! thanks for this. i am teaching a story time/craft at an indoor playplace tomorrow. 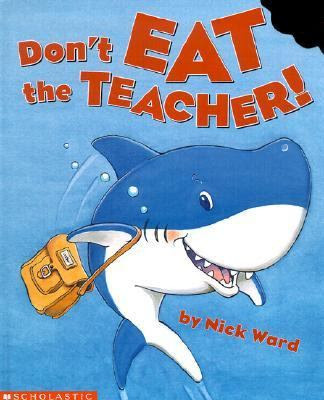 i had picked the Ward book, Don't Eat the Teacher and was looking for an easy shark craft for the kids to do after the story. I found your post and I love the craft! Easy enough for the preschool bunch I'll be teaching - as long as everything is pre-cut for them. thanks again! this is just perfect!